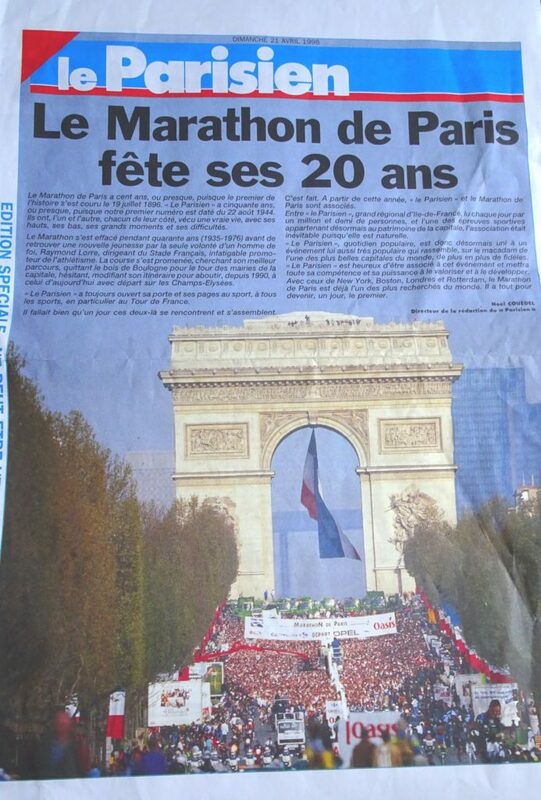 The 1996 Paris Marathon. 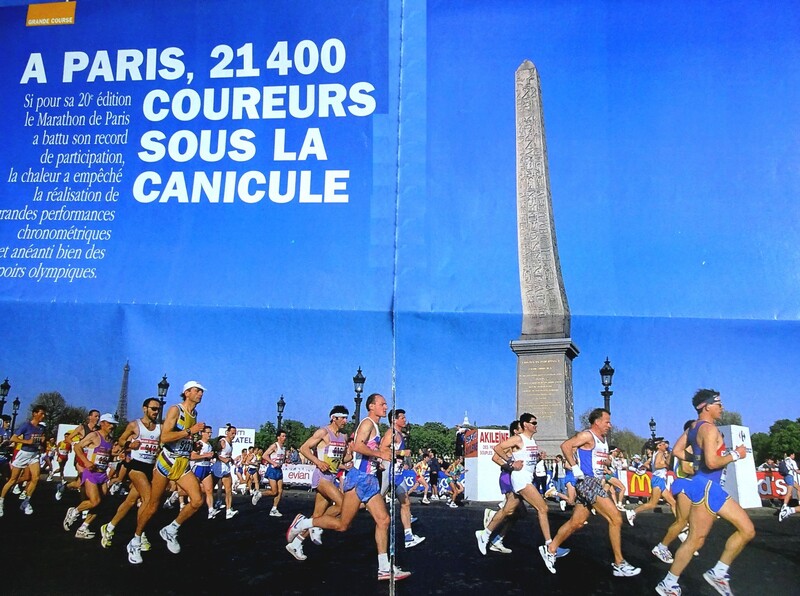 The 20 years of the “new” marathon in Paris, the 100 years since the very first marathon in Paris… and my first marathon! At the time the Paris marathon was called the “Marathon of Paris”, it was not preceded by the name of the official sponsor as it is now. It was held at the end of April and not at the beginning of the month. Likely to be hotter, this was the case in 1996. The departure was at 9:00 AM (instead of 8:45 AM to meet the requirements of television broadcasting – departure in 2018: 8:20 AM). The route was not very different from 2018 (see the link above). There was very little use of the Internet, we didn’t register online but by mail and bank cheque. If you did not have an athletics licence, the medical certificate could not be a simple copy, it had to be a certified copy, therefore we had to make several copies and go to the town hall to have them certified with an official stamp. No electronic chip, passages at the finishing line were taken into account by volunteers or other means (for some races, the bibs were picked up and collected according to the finish, sometimes with small spikes to group them together). No real time therefore, only official times, recorded when crossing the finish line whatever the time you started. Finally, what mattered to me was finishing the marathon, which I did but with one small disappointment: having walked during the marathon. In fact, inexperienced, I had taken dried fruits that gave me some nausea and forced me to walk… in short, one of my first lessons: to test in training what you intend to absorb during the marathon….